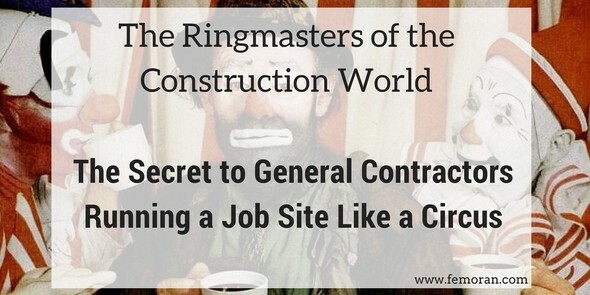 A general contractor is like a ring master at a circus. One minute you have bears riding trikes, the next you have lions jumping through hoops. All the while, it is all orchestrated perfectly. The acts coordinate flawlessly. The show ends on time. The show seems chaotic and busy to the audience, but it is running as planned. The GC coordinates the sub-contractors, getting them to work together and navigate the construction site like it was a stage. GC's make it look so effortless, but it is anything but. The circus that is construction takes great coordination and planning. They need the right contractors at the right time for the right money. So, how do we make this easier? Here are our 3 tips to streamlining GC work. The Boston Consulting Group conducted a study and found that, "Within ten years, according to our estimates, full-scale digitalization in non-residential construction will lead to annual global cost savings of $.7 trillion to $1.2 trillion (13%-21%) in the engineering and construction phases and $.3 trillion to $.5 trillion (10%-17%) in the operations phase." By using smart software, digital sensors in personal protective equipment, intelligent machines, and drones, GC's can eliminate a lot of wasted time with manual plotting, notes, and reporting. Communication should be a constant. By using collaborative work management (CWM) software, general contractors can keep communication within one tool. The GC, subcontractors, and the developer can all have access to the tool to see the project timeline, comment on project elements, view equipment needs, and pull reports. Tools like Samepage, Dapulse, and Smartsheet allow all stakeholders to collaborate on documents, calendars, and communication. Keep it simple and consolidate. General contractors don't have to hire a different sub-contractor for every element of a job. Find sub-contractors that are experienced in multiple areas of the job. Did you know that The Moran Group has companies that are experts in fire protection, plumbing, and HVAC? By hiring a company that has multiple areas of expertise, they can coordinate amongst themselves and cut down on the work that the GC needs to do. The ring master makes it all happen, and so does the general contractor. By streamlining processes through technology adaption, communicating effectively, and consolidating sub-contractors, you can keep the job site running smoothly with less effort.